The South Pacific Sea Level and Climate Monitoring Project (SPSLCMP) hasn’t been running for long and didn’t contribute to the new paper mentioned below, but we ought to remember that this Australian project exists. 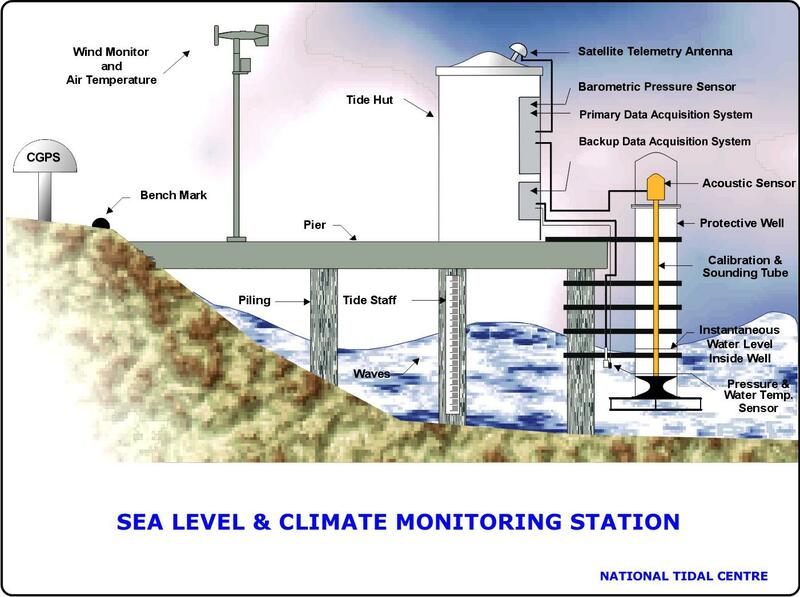 It constantly monitors sea level and other metrics in the countries named above and issues monthly reports. The warnings we hear from various island communities and environmental groups about rising sea level driving people from their homes — potentially very alarming — turn out, in the light of these scientific observations, to be alarming only for their despicable lack of disclosure of the truth. Yet their alarming statements are never questioned by the mainstream media. TV1’s Pacific reporter, Barbara Dreaver, is surely the leading wide-eyed journalist to misreport sea levels and subsequent social suffering, though she’s not the only one. A new analysis finds evidence of a weak deceleration in mean sea level rise in the Australasian region from 1940 to 2000 in four very long-term tide gauge records. It brings long-term confirmation to what the South Pacific Sea Level and Climate Monitoring Project (SPSLCMP) has been reporting for about 10 to 15 years — slow, non-alarming sea level rise. A schematic diagram of a modern sea level monitoring station. Click for larger version. Although the research focuses on our trans-Tasman neighbours, it also includes an analysis of Auckland, giving another insight into our likely coastal future. However, failing to present a dramatic story, it probably will not get the same media attention as the Emerging Issues paper from the Royal Society of New Zealand in September, 2010, which looked at new research on sea level rise and tried to alarm us all. Yet, stupendously, the new paper offers the best possible news for those at risk from rising sea levels, as it thoroughly refutes the nonsensical scare stories about “accelerating” sea level rise. Our newspapers and television stations must ignore good news like this precisely because it’s not alarming. Otherwise, why have they not told us the truth? Who wouldn’t be left with an impression of dangerous rise, starting now? For the decades and centuries that are important for planning purposes, we cannot yet state the likelihood of a given rate of sea level rise. What?! The paper gives us a powerful push in a neutral direction! So why on earth did they bother writing it? Has the Royal Society said anything about the Australian paper cited below? Or has the Green Party? Or NIWA? NIWA must have heard about the sea level monitoring project, since they have such a cosy relationship with the BOM, who run it, so they must have noticed that this latest paper confirms the lack of accelerated rise reported by the monitoring. Why don’t they mention it? After all, it’s very good news. P. J. Watson is the Principal Coastal Specialist, NSW Department of Environment, Climate Change and Water, PO Box 2185, Dangar, NSW, Australia 2309. Here, for some perspective, is the latest graph of sea level trends in the South Pacific — to the end of February, 2011. The graph that puts to rest the hyperbole about dangerously-rising sea levels in the Pacific. Are you listening, Miss Dreaver? BoM: “The analysis reveals a consistent trend of weak deceleration at each of these gauge sites throughout Australasia over the period from 1940 to 2000”. I assume this means that actual Australasian coastal sea levels (as opposed to eustatic or notional ‘global’ levels) have risen throughout the course of the 20th century, but the speed of that rise became lower and lower as time went by. If this is the case, it would seem to prove that coastal sea levels are poorly correlated with global warming. Or not correlated at all, actually, if the rise was decelerating while atmospheric warmth was accelerating during 1978-98. Rather, it is consistent with the hypothesis that sea levels have risen continuously since the end of the LIA, but that rise is slowly losing momentum. Yes, and if it’s true that sea levels are poorly correlated with temperature, it means they are rising in “recovery” from the LIA because ice is melting or there’s another source of water, but neither is triggered by an increase in atmospheric temperature. Curious! Has insolation increased or cloud cover decreased? That the answer is no, in spite of “a projected global rise in mean sea level of up to 100 cm over the 21st century” seems to be very difficult to admit and the author may even be disappointed that one of the “multiple lines of evidence” is just not meeting expectations. It’s as if accelerating sea level rise is a fait accompli and it’s just a matter of time before it kicks in (but not “yet”). There are now less than 90 years left of the 21st century for the projected rise to occur but if the deceleration of 0.02-0.04 mm/year/year continues then the 2100 rate can be calculated using the average initial velocity (Vi) of the 1920-2000 rise which was 120/80 = 1.5mm/year (current global satellite 3.1mm/year). by substituting in a = (Vf – Vi)/t. So now Barbara Dreaver can breathlessly announce that by 2060 sea levels in the vicinity of Australia and New Zealand will have stopped rising and by 2100 will be falling at -1.2mm per year – a good news scoop for TV1. Bryan Walker at Hot Topic can stop writing 3 hanky weepies about the poor folks of the Pacific low-lying islands that were sure to be inundated and instead break the joyful news to his loyal readers that the latest science indicates a wonderful reprieve. The Royal Society of New Zealand will rush these findings post haste to the PM’s climate change adviser Sir Peter Gluckman who will immediately brief the PM and the Minister of Climate Change so that govt departments and the people of NZ are informed of this amazing turnaround from predictions and we can all celebrate the let-off from catastrophe . It’s just a warm fuzzy feel good story all around. The paper describes “Short period trends of acceleration in mean sea level after 1990”. During the first half of the 90s, cloud cover (mainly low-level) did decrease (low-level cloud is not modeled) allowing an insolation increase at the sea surface, the result being increased ocean heat and thermal expansion which shows up as the short periods of sea level rise acceleration. Svensmark explains the cloud cover change as the solar wind modulated cosmic ray effect.. Figure 3: Global Albedo change 1984 – 2004 shows the effect of cloud cover change and solar energy flux. “IPCC reject irradiance as a cause of temperature change since 1950, but they also reject variations in sun/earth relationships, known as the Milankovitch Effect and the relationship between sunspots and temperature hypothesized by the Svensmark Cosmic Theory. The latter shows a relationship between changes in solar magnetism evidenced by sunspots. As the magnetism varies it determines the amount of galactic cosmic radiation reaching the Earth, which creates low cloud. As low cloud varies albedo varies. Nice analysis. Lots of warm fuzzies, little looking at facts. I like ‘3-hanky weepies’! It’s exactly what he does. In 1836 in his travels on the HMS Beagle Darwin observed that in the Western Pacific the sea level must be slowly rising as compared to the bits of land showing. He came to this conclusion from observing that there were no old coral reefs exposed on the land, rather the islands were either ringed by coral or there were simply coral rings. He knew that reef coral only survived to 10 fathoms (60 feet) and that below that it was merely dead coral stacked on top of dead coral. He therefore deduced that atolls where the remains of subsided islands. Darwin even had an idea of the rate of rise of the sea level. He concluded nearly 200 years ago from simple observation and logic that the rate of rise of sea levels had to be less than the rate of growth of reef coral. If Tuvalu looks after its coral it should be OK.
Bad news for the Pleasant Point Yacht club. The building is stuffed and sinking into the swamp. I’m inclined to agree that the Watson analysis is very poor. Tamino dissects Fremantle and finds acceleration from (approx) 1897 – 1927, deceleration 1927 – 1975 and acceleration 1975 – 2009. I doubt that a Loess smoothing for Auckland would return a similar acceleration to Fremantle due to falling levels 2000 -2009 (Fremantle rising over that period) but might still be a recent acceleration. I haven’t got a link to the Auckland data source but Hannah 2010 is referred to by Hannah, Bell, Paulik 2010.
a = 2 \beta_2 + 6 \beta_3 t + 12 \beta_4 t^2. (see the blog post for this). 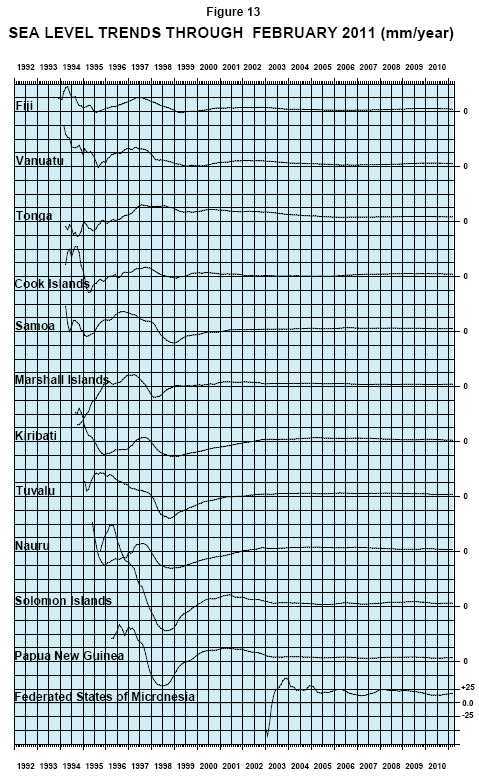 It comes as absolute values above a datum, Tamino has plotted an anomaly but doesn’t give the baseline but I assume it’s the entire series. Then he computes a second anomaly to remove the annual cycle then smooths with Loess. which is surely better (?) than Watson’s moving average. What’s has got my attention is Tamino’s method of deriving instantaneous acceleration which is different to looking for a departure from a long-term trend that I’ve been looking for. I haven’t looked at the local tide guage data in this light, I’ve mainly been looking at the global satellite trend using a 3rd order polynomial (Loess might be better) which seems a good fit to my unskilled eye. It’s easy then to eyeball approximate instantaneous rates. Andy, you’re the mathematician. Bob, Gary, You guys have stats knowledge that I haven’t – any comments on the Tamino post? Watson 2011 is the subject of the latest JoNova post (CCG was on to it in April). Thanks Ross # 25 for the Axel Morner article, it’s been a while since I’ve looked at the issues in it but revisiting them in the light of what I’ve learned since makes it all the more relevant. Re Tamino. A curve fitting exercise like his will show both recent acceleration and deceleration in individual tide guage data but they are very small and so what? It’s the global aggregate that matters. The required rates of global acceleration for any levels above normal (18mm/decade tide guage, 31mm/decade satellite) are just not evident recently. Houston and Dean refute Rahmsdorf and Vermmeer saying they “are curve fitting, not modeling physics, so the approach cannot be used to predict future sea level”. Even the IPCC has discounted the R & V proposition for the lack of physical relationships. The other problem I see is that once a model has been fitted e.g. Tamino’s, the apparently “better” correlation is then projected into the future with alarming connotations e.g. Tamino. This ignores the bigger picture (OHC stalled since 2003/04, clouds, grand solar minimum prediction etc) where there isn’t the drivers to continue the projection. Reply to: Rahmstorf, S. and Vermeer, M., 2011. Discussion of: Houston, J.R. and Dean, R.G., 2011. It puts Auckland in broad perspective including millennial and global, also cites Watson 2011. The pdf at nzclimatescience wouldn’t save to disk for some reason. The SEAFRAME sea-level study on 12 Pacific islands is the most comprehensive study of sea level and local climate ever carried out there. 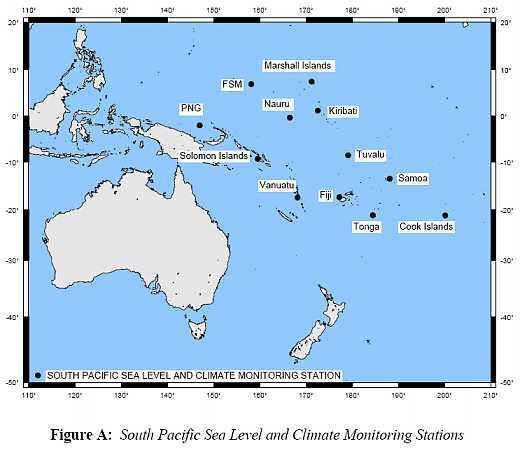 The sea level records obtained have all been assessed by the anonymous authors of the official reports as indicating positive trends in sea level over all 12 Pacific Islands involved since the study began in 1993 until the latest report in June 2010. In almost all cases the positive upward trends depend almost exclusively on the depression of the ocean in 1997 and 1998 caused by two tropical cyclones. If these and other similar disturbances are ignored, almost all of the islands have shown negligible change in sea level from 1993 to 2010, particularly after the installation of GPS levelling equipment in 2000.